The African Union (AU) is a continental union consisting of 55 member states located on the continent of Africa, with exception of various territories of European possessions located in Africa. The bloc was founded on 26 May 2001 in Addis Ababa, Ethiopia and launched on 9 July 2002 in South Africa. The intention of the AU is to replace the Organisation of African Unity (OAU), established on 25 May 1963 in Addis Ababa by 32 signatory governments. The most important decisions of the AU are made by the Assembly of the African Union, a semi-annual meeting of the heads of state and government of its member states. The AU’s secretariat, the African Union Commission, is based in Addis Ababa. The AU has adopted a number of important new documents establishing norms at continental level, to supplement those already in force when it was created. These include the African Union Convention on Preventing and Combating Corruption (2003), the (2007), the New Partnership for Africa’s Development (NEPAD) and its associated Declaration on Democracy, Political, Economic and Corporate Governance. Critics argued that the OAU in particular did little to protect the rights and liberties of African citizens from their own political leaders, often dubbing it the “Dictators’ Club”. 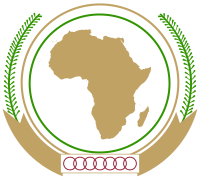 The idea of creating the AU was revived in the mid-1990s under the leadership of Libyan head of state Muammar al-Gaddafi: the heads of state and government of the OAU issued the Sirte Declaration (named after Sirte, in Libya) on 9 September 1999, calling for the establishment of an African Union. The Declaration was followed by summits at Lomé in 2000, when the Constitutive Act of the African Union was adopted, and at Lusaka in 2001, when the plan for the implementation of the African Union was adopted. During the same period, the initiative for the establishment of the New Partnership for Africa’s Development (NEPAD), was also established. Member states of the African Union cover almost the entirety of continental Africa, except for several territories held by Spain (Canary Islands, Plazas de soberanía); France (Mayotte, Réunion, Scattered Islands in the Indian Ocean); Portugal (Madeira, Savage Islands); and the United Kingdom (Saint Helena, Ascension and Tristan da Cunha). Consequently, the geography of the African Union is wildly diverse, including the world’s largest hot desert (the Sahara), huge jungles and savannas, and the world’s longest river (the Nile). The AU presently has an area of 29,922,059 square kilometres (11,552,972 sq mi), with 24,165 kilometres (15,015 mi) of coastline. The vast majority of this area is on continental Africa, while the only significant territory off the mainland is the island of Madagascar (the world’s fourth largest island), accounting for slightly less than 2% of the total. The secretariat of the African Union, composed of ten commissioners and supporting staff and headquartered in Addis Ababa, Ethiopia. In a similar fashion to its European counterpart, the European Commission, it is responsible for the administration and co-ordination of the AU’s activities and meetings. An advisory organ composed of professional and civic representatives, similar to the European Economic and Social Committee. The chair of ECOSOCC, elected in 2008, is Cameroonian lawyer Akere Muna of the (PALU). The African Commission on Human and Peoples’ Rights, in existence since 1986, is established under the African Charter on Human and Peoples’ Rights (the African Charter) rather than the Constitutive Act of the African Union. It is the premier African human rights body, with responsibility for monitoring and promoting compliance with the African Charter. The African Court on Human and Peoples’ Rights was established in 2006 to supplement the work of the Commission, following the entry into force of a protocol to the African Charter providing for its creation. It is planned that the African Court on Human and Peoples’ Rights will be merged with the Court of Justice of the African Union (see above). The principal topic for debate at the July 2007 AU summit held in Accra, Ghana, was the creation of a Union Government, with the aim of moving towards a United States of Africa. A study on the was adopted in late 2006, and proposes various options for “completing” the African Union project. 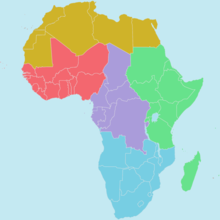 There are divisions among African states on the proposals, with some (notably Libya) following a maximalist view leading to a common government with an AU army; and others (especially the southern African states) supporting rather a strengthening of the existing structures, with some reforms to deal with administrative and political challenges in making the AU Commission and other bodies truly effective. 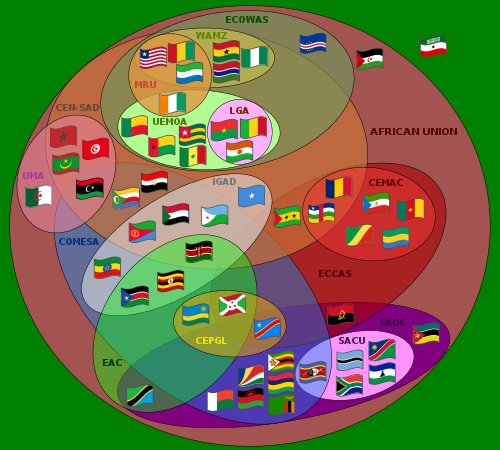 In 2006, the AU decided to create a Committee “to consider the implementation of a rotation system between the regions” in relation to the presidency. Controversy arose at the 2006 summit when Sudan announced its candidacy for the AU’s chairmanship, as a representative of the East African region. Several member states refused to support Sudan because of tensions over Darfur (see also below). Sudan ultimately withdrew its candidacy and President Denis Sassou-Nguesso of the Republic of the Congo was elected to a one-year term. At the January 2007 summit, Sassou-Nguesso was replaced by President John Agyekum Kufuor of Ghana, despite another attempt by Sudan to gain the chair. 2007 was the 50th anniversary of Ghana’s independence, a symbolic moment for the country to hold the chair of the AU—and to host the mid-year summit at which the proposed Union Government was also discussed. In January 2008, President Jakaya Kikwete of Tanzania took over as chair, representing the East African region and thus apparently ending Sudan’s attempt to become chair—at least till the rotation returns to East Africa. The current chair is Egypt. ICC – Extraordinary Summit Ethiopia Addis Ababa 11–12 October 2013 “Africa’s relationship with the ICC” This was in regards to the ICC’s non-adherence to AU calls to drop certain charges against sitting leaders and that it was disproportionally targeting Africans. Upon the election of Donald Trump for the presidency of the U.S., in 2017, the latter passed an executive order for a ban on citizens from seven countries with suspected links to terrorism, that concerns three African countries. During the 28th African Union Summit, in Ethiopia, African leaders criticised the ban as they expressed their growing concerns for the African Economy, under Trump’s policies. The AU’s future goals include the creation of a free trade area, a customs union, a single market, a central bank, and a common currency (see African Monetary Union), thereby establishing economic and monetary union. The current plan is to establish an African Economic Community with a single currency by 2023. The AU has been active in addressing the AIDS pandemic in Africa. In 2001, the AU established AIDS Watch Africa to coordinate and mobilise a continent-wide response. Sub-Saharan Africa, especially southern and eastern Africa, is the most affected area in the world. Though this region is home to only 6.2% of the world’s population, it is also home to half of the world’s population infected with HIV. While the measurement of HIV prevalence rates has proved methodologically challenging, more than 20% of the sexually active population of many countries of southern Africa may be infected, with South Africa, Botswana, Kenya, Namibia, and Zimbabwe all expected to have a decrease in life expectancy by an average of 6.5 years. The pandemic has had massive implications for the economy of the continent, reducing economic growth rates by 2–4% across Africa. In July 2007, the AU endorsed two new initiatives to combat the AIDS crisis, including a push to recruit, train and integrate 2 million community health workers into the continent’s healthcare systems. Daniel Batidam, an anti-corruption advisory board member of the African Union, resigned after stating that the organisation had “multiple irregularities” and that “issues have come up over and over again” regarding corruption. The African Union quickly accepted his resignation, with Batidam saying that it was a sign that mismanagement towards corruption will “continue with business as usual”. When the conflicts in Libya began in 2011, the African Union was initially criticised for not doing much to prevent the escalation of conflict in Libya. Additionally, the AU hesitated to take a side when the conflict in Libya began. There was some vagueness when it came to the African Union’s position in the conflict, it was unclear if they were fully supporting the Libyan regime or if they were instead supporting the Libyan citizens. This ambiguity occurred right around the time when there were several human right violations against the Libyan regime. It was later realised that the hesitation in the AU’s response to the Arab Spring in Libya was due to its lack of capacity and capability for engaging in democratic reforms. The AU attempted to mediate in the early stages of the 2011 Libyan civil war, forming an ad hoc committee of five presidents (Congolese President Denis Sassou Nguesso, Malian President Amadou Toumani Touré, Mauritanian President Mohamed Ould Abdel Aziz, South African President Jacob Zuma, and Ugandan President Yoweri Museveni) to broker a truce. However, the beginning of the NATO-led military intervention in March 2011 prevented the committee from traveling to Libya to meet with Libyan leader and former head of the AU until 2010 Muammar Gaddafi. As a body, the AU sharply dissented from the United Nations Security Council‘s decision to create a no-fly zone over Libya, though a few member states, such as Botswana, Gabon, Zambia, and others expressed support for the resolution. As a result of Gaddafi’s defeat at the Battle of Tripoli, the decisive battle of the war, in August 2011, the Arab League voted to recognise the anti-Gaddafi National Transitional Council as the legitimate government of the country pending elections, yet although the council has been recognised by several AU member states, including two countries that are also members of the Arab League, the AU Peace and Security Council voted on 26 August 2011 not to recognise it, insisting that a ceasefire be agreed to and a national unity government be formed by both sides in the civil war. A number of AU member states led by Ethiopia, Nigeria, and Rwanda requested that the AU recognise the NTC as Libya’s interim governing authority, and several other AU member states have recognised the NTC regardless of the Peace and Security Council’s decision. However, AU member states Algeria and Zimbabwe have indicated they will not recognise the NTC, and South Africa has expressed reservations as well. In response to the death of Gnassingbé Eyadéma, President of Togo, on 5 February 2005, AU leaders described the naming of his son Faure Gnassingbé the successor as a military coup. Togo’s constitution calls for the speaker of parliament to succeed the president in the event of his death. By law, the parliament speaker must call national elections to choose a new president within sixty days. The AU’s protest forced Gnassingbé to hold elections. Under heavy allegations of election fraud, he was officially elected President on 4 May 2005. One of the objectives of the AU is to “promote peace, security, and stability on the continent”. Among its principles is “Peaceful resolution of conflicts among Member States of the Union through such appropriate means as may be decided upon by the Assembly”. The primary body charged with implementing these objectives and principles is the Peace and Security Council. The PSC has the power, among other things, to authorise peace support missions, to impose sanctions in case of unconstitutional change of government, and to “take initiatives and action it deems appropriate” in response to potential or actual conflicts. The PSC is a decision-making body in its own right, and its decisions are binding on member states. Since it first met in 2004, the PSC has been active in relation to the crises in Darfur, Comoros, Somalia, Democratic Republic of Congo, Burundi, Côte d’Ivoire and other countries. It has adopted resolutions creating the AU peacekeeping operations in Somalia and Darfur, and imposing sanctions against persons undermining peace and security (such as travel bans and asset freezes against the leaders of the rebellion in Comoros). The Council is in the process of overseeing the establishment of a “standby force” to serve as a permanent African peacekeeping force. Institute for Security Studies, South Africa, March 2008. In response to the ongoing Darfur conflict in Sudan, the AU has deployed 7,000 peacekeepers, many from Rwanda and Nigeria, to Darfur. While a donor’s conference in Addis Ababa in 2005 helped raise funds to sustain the peacekeepers through that year and into 2006, in July 2006 the AU said it would pull out at the end of September when its mandate expires. Critics of the AU peacekeepers, including Dr. Eric Reeves, have said these forces are largely ineffective due to lack of funds, personnel, and expertise. Monitoring an area roughly the size of France has made it even more difficult to sustain an effective mission. In June 2006, the United States Congress appropriated US$173 million for the AU force. Some, such as the Genocide Intervention Network, have called for UN or NATO intervention to augment and/or replace the AU peacekeepers. The UN has considered deploying a force, though it would not likely enter the country until at least October 2007. The under-funded and badly equipped AU mission was set to expire on 31 December 2006 but was extended to 30 June 2007 and merged with the United Nations African Union Mission in Darfur in October 2007. In July 2009 the African Union ceased cooperation with the International Criminal Court, refusing to recognise the international arrest warrant it had issued against Sudan’s leader, Omar al-Bashir, who was indicted in 2008 for war crimes. From the early 1990s up until 2000, Somalia was without a functioning central government. A peace agreement aimed at ending the civil war that broke out following the collapse of the Siad Barre regime was signed in 2006 after many years of peace talks. However, the new government was almost immediately threatened by further violence. In February 2007, the African Union (AU) and European Union (EU) worked together to establish the African Union Mission in Somalia (AMISOM). The purpose of AMISOM was to create a foundation that would hopefully provide aid to some of Somalia’s most vulnerable and keep the peace in the region. They are tasked with everything from protecting federal institutions to facilitating humanitarian relief operations. Much of the AU’s opposition comes from an Islamic extremist group named al-Shabaab. To temporarily shore up the government’s military base, starting in March 2007, AU soldiers began arriving in Mogadishu as part of a peacekeeping force that was intended by the AU to eventually be 8,000 strong. Eritrea recalled its ambassadors to the African Union on 20 November 2009 after the African Union called on the United Nations Security Council to impose sanctions on them due to their alleged support of Somali Islamists attempting to topple the Transitional Federal Government of Somalia, the internationally recognised government of Somalia which holds Somalia’s seat on the African Union. On 22 December 2009, the United Nations Security Council passed UNSCR 1907, which imposed an arms embargo on Eritrea, travel bans on Eritrean leaders, and asset freezes on Eritrean officials. Eritrea strongly criticised the resolution. In January 2011, Eritrea reestablished their mission to the AU in Addis Ababa. A successful 2008 invasion of Anjouan by AU and Comoros forces to stop self-declared president Mohamed Bacar, whose 2007 re-election was declared illegal. Prior to the invasion, France helped transport Tanzanian troops but their position in the disagreement was questioned when a French police helicopter was suspected of attempting to sneak Bacar into French exile. The first wave of troops landed on Anjouan Bay on 25 March and soon took over the airfield in Ouani, ultimately aiming to locate and remove Bacar from office. On the same day, the airport, capital, and second city were overrun and the presidential palace was deserted. Bacar escaped and sought asylum in France and the government of Comoros demanded they return him so they may determine his consequence. Many of Bacar’s primary supporters were arrested by the end of March, including Caabi El-Yachroutu Mohamed and Ibrahim Halidi. His asylum request was rejected in 15 May as France agreed to cooperate with the Comoran governments demand. His presidential position was then occupied by Moussa Toybou after winning the election in 29 June. ^ “African Union anthem, etc”. Africamasterweb.com. Archived from the original on 15 September 2015. Retrieved 26 November 2012. ^ “African Union votes to readmit Morocco”. 19 September 2018 – via www.bbc.com. ^ Thabo Mbeki (9 July 2002). “Launch of the African Union, 9 July 2002: Address by the chairperson of the AU, President Thabo Mbeki”. ABSA Stadium, Durban, South Africa: africa-union.org. Archived from the original on 3 May 2009. Retrieved 8 February 2009. ^ African Union replaces dictators’ club, BBC, 8 July 2002. ^ Smith, David (5 September 2010). “Africa prepares to join the big boys in the space race”. The Guardian. ^ Smith, David (6 September 2012). “Sudanese president calls for African space agency”. The Guardian. ^ “Africa eyes joint space agency”. Phys.org. 11 September 2012. Retrieved 21 October 2013. ^ Ezigbo, Onyebuchi; Okpara, Lois (9 August 2010). “AU to Establish African Space Agency”. All Africa. Retrieved 11 December 2015. ^ Lee, Carol E. “Obama Becomes First U.S. President to Address African Union”. Wall Street Journal. Retrieved 29 July 2015. ^ “Remarks by President Obama to the People of Africa”. The White House. Retrieved 29 July 2015. ^ “Protocol on the Amendments to the Constitutive Act of the African Union | African Union”. www.au.int. Retrieved 20 February 2018. ^ “Ethiopia: AU Launches 2006 As Year of African Languages”. AllAfrica.com. 21 June 2006. Retrieved 30 October 2016. ^ Project for the Study of Alternative Education in South Africa (2006). “The Year of African Languages (2006) – Plan for the year of African Languages – Executive Summary”. Project for the Study of Alternative Education in South Africa. Archived from the original on 23 September 2006. Retrieved 30 September 2006. ^ “Morocco rejoins African Union”. Worldbulletin. 30 January 2017. Retrieved 31 January 2017. ^ “Decision on the Report of the Executive Council on the Audit of the Union and the Report of the Ministerial Committee on the Union Government, Doc. Assembly/Au/8(X)” (PDF). Archived from the original (PDF) on 22 February 2012. Retrieved 26 November 2012. ^ According to the AU Archived 6 October 2011 at the Wayback Machine, his official style is Son Excellence Obiang Nguema Mbasogo, Président de la République, Chef de l’État et Président Fondateur du Parti Démocratique de Guinée Equatoriale (in French). Retrieved 4 October 2011. ^ “President Paul Kagame, Elected as New Chairperson of the African Union for the year 2018 – African Union”. au.int. ^ Linyan, Wang. “New headquarters shows partnership entering era of hope: Ethiopia PM”. China Daily. Retrieved 2 February 2012. ^ a b c Diplomat, Shannon Tiezzi, The. “If China Bugged the AU Headquarters, What African Countries Should Be Worried?”. The Diplomat. Retrieved 4 February 2018. ^ “A Addis-Abeba, le siège de l’Union africaine espionné par Pékin”. Le Monde.fr (in French). Retrieved 4 February 2018. ^ “AU spying report absurd: China”. enca.com. Retrieved 21 March 2018. ^ “African Union says has no secret dossiers after China spying report”. reuter.com. Retrieved 21 March 2018. ^ “30th AU summit”. Retrieved 21 March 2018. ^ “29th AU summit”. 5 July 2017. Retrieved 15 November 2017. ^ “28th AU summit”. 30 January 2017. Retrieved 31 January 2017. ^ “27th AU summit”. July 2016. Retrieved 29 September 2016. ^ “26th AU summit”. January 2016. Retrieved 29 September 2016. ^ “25th AU summit”. June 2015. Retrieved 29 September 2016. ^ “25th African Union Summit in Johannesburg – African Union Commission media information”. June 2015. Retrieved 29 September 2016. ^ “A Call for Global Support in Ending Women’s Violence Done by Angelina Jolie”. newswatchngr.com. Newwatch NGR. February 2016. Retrieved 23 February 2016. ^ “24th AU summit”. January 2015. Archived from the original on 24 June 2015. Retrieved 29 September 2016. ^ “Second Turkey-Africa Partnership Summit”. November 2014. Archived from the original on 25 December 2016. Retrieved 29 September 2016. ^ “Africa Turkey 2014”. November 2014. Archived from the original on 23 December 2015. Retrieved 29 September 2016. ^ “23rd AU summit”. June 2014. Archived from the original on 9 July 2014. Retrieved 29 September 2016. ^ “22nd AU summit”. January 2014. Archived from the original on 14 February 2015. Retrieved 29 September 2016. ^ “22nd Ordinary Session of the Summit of the African Union”. January 2014. Archived from the original on 14 February 2014. Retrieved 29 September 2016. ^ “AU Extraordinary Summit on ICC”. October 2013. Archived from the original on 20 December 2013. Retrieved 29 September 2016. ^ “Kenya pushing for African split from International Criminal Court”. Irish Times. Retrieved 30 January 2014. ^ “21st AU summit”. May 2013. Archived from the original on 1 July 2013. Retrieved 29 September 2016. ^ “20th AU summit”. January 2013. Archived from the original on 9 May 2013. Retrieved 29 September 2016. ^ “Global Africa Diaspora Summit”. May 2012. Archived from the original on 16 September 2015. Retrieved 29 September 2016. ^ “19th African Union (AU) Summit to be held in Addis Ababa, Ethiopia”. June 2012. Retrieved 29 September 2016. ^ “18th AU summit”. January 2012. Archived from the original on 14 June 2014. Retrieved 29 September 2016. ^ “17th AU summit”. June 2011. Archived from the original on 23 December 2015. Retrieved 29 September 2016. ^ “2nd Africa-India Forum Summit”. May 2011. Archived from the original on 31 March 2014. Retrieved 29 September 2016. ^ “16th African Union summit”. January 2011. Archived from the original on 4 March 2016. Retrieved 29 September 2016. ^ “15th African Union summit”. July 2010. Archived from the original on 9 September 2011. Retrieved 29 September 2016. ^ “14th African Union summit”. January 2010. Archived from the original on 11 October 2011. Retrieved 29 September 2016. ^ “13th African Union summit”. July 2009. Archived from the original on 2 November 2011. Retrieved 29 September 2016. ^ “12th African Union summit”. January 2009. Archived from the original on 2 November 2011. Retrieved 29 September 2016. ^ “The 11th AU summit”. July 2008. Archived from the original on 11 October 2011. Retrieved 29 September 2016. ^ “The 10th African Union summit”. January 2008. Archived from the original on 2 November 2011. Retrieved 29 September 2016. ^ “9th African Union summit”. July 2007. Archived from the original on 2 November 2011. Retrieved 29 September 2016. ^ “8th African Union summit”. January 2007. Archived from the original on 6 August 2011. Retrieved 29 September 2016. ^ “7th African Union summit”. July 2006. Archived from the original on 6 August 2011. Retrieved 29 September 2016. ^ “6th African Union summit”. January 2006. Archived from the original on 14 February 2008. Retrieved 29 September 2016. ^ “5th African Union summit”. June 2005. Archived from the original on 24 February 2008. Retrieved 29 September 2016. ^ “AU Summit”. Archived from the original on 15 February 2008. Retrieved 29 September 2016. ^ “4th African Union summit”. January 2005. Archived from the original on 15 March 2008. Retrieved 29 September 2016. ^ “3rd African Union summit”. July 2004. Archived from the original on 7 February 2008. Retrieved 29 September 2016. ^ “African Union Summit Maputo Mozambique”. July 2003. Archived from the original on 8 July 2004. Retrieved 29 September 2016. ^ “OAU/AU summit”. June 2002. Archived from the original on 22 October 2016. Retrieved 29 September 2016. ^ “1st AU summit: Documents and Speeches”. June 2002. Archived from the original on 1 October 2016. Retrieved 29 September 2016. ^ Frugé, Anne (1 July 2016). “The Opposite of Brexit: African Union Launches an All-Africa Passport”. The Washington Post. ^ “African Union Slams Trump Muslim Ban, Invoking Legacy of Transatlantic Slave Trade”. Democracy Now!. Retrieved 1 February 2017. ^ “Profile: African Union”. BBC News. 1 July 2006. Archived from the original on 12 July 2006. Retrieved 10 July 2006. ^ a b c “The World Bank DataBank | Explore. Create. Share”. databank.worldbank.org. Retrieved 4 February 2017. ^ Office, Human Development Report. “2015 Human Development Report”. report.hdr.undp.org. Retrieved 4 February 2017. ^ “The Fragile States Index 2016 | The Fund for Peace”. fsi.fundforpeace.org. Archived from the original on 4 February 2017. Retrieved 12 February 2017. ^ e.V., Transparency International. “Corruption Perceptions Index 2016”. www.transparency.org. Retrieved 12 February 2017. ^ “Index of Economic Freedom: Promoting Economic Opportunity and Prosperity by Country”. www.heritage.org. Retrieved 12 February 2017. ^ “Vision of Humanity”. static.visionofhumanity.org. Archived from the original on 13 February 2017. Retrieved 12 February 2017. ^ “2016 World Press Freedom Index | Reporters Without Borders”. RSF. Retrieved 12 February 2017. ^ “Democracy Index 2016” (PDF). Economist Intelligence Unit. Archived from the original (PDF) on 24 February 2017. Retrieved 12 February 2017. ^ “The World Factbook — Central Intelligence Agency”. www.cia.gov. Retrieved 4 February 2017. ^ “Fès Festival of World Sacred Music”. Lonely Planet. Retrieved 4 September 2018. ^ “Knysna Oyster Festival”. Oyster Festival. Retrieved 4 September 2018. ^ Lanyado, Benji. “Malawi’s musical turn”. The Guardian. Retrieved 4 September 2018. ^ Okanla, Karim. “Benin marks Voodoo Day”. BBC News. Retrieved 4 September 2018. ^ “Zulu Reed Dance”. Eshowe. Archived from the original on 18 August 2013. Retrieved 4 September 2018. ^ Chiba, Yasuyoshi. “Pictures of the Day: 21 June 2018”. The Telegraph. Retrieved 4 September 2018. ^ Dixon, Simon; McDonald, Scott; Roberts, Jennifer (2002). “The Impact Of HIV And AIDS On Africa’s Economic Development”. BMJ: British Medical Journal. 324 (7331): 232–234. JSTOR 25227281. ^ Barton-Knott, Sophie (3 July 2017). “African Union endorses major new initiatives to end AIDS”. UNAIDS. Retrieved 6 August 2017. ^ Buse, Kent (January 2012). “Zeroing in on AIDS and Global Health Post-2015”. Globalization and Health. 8: 42–44. ^ “Official quits AU anti-corruption body over ‘multiple irregularities‘“. Radio France Internationale. 23 June 2018. Retrieved 31 January 2019. ^ a b Hove, Mediel (May 2017). “Post-Gaddafi Libya and the African Union: Challenges and the Road to Sustainable Peace”. Journal of Asian & African Studies. 52: 271–286. ^ “African Union urges restraint on both sides”. The Star. 21 March 2011. Archived from the original on 21 March 2011. Retrieved 5 July 2011. ^ Mulondo, Emmanuel (21 March 2011). “Kutesa, AU blocked from entering Libya”. Daily Monitor. Retrieved 21 March 2011. ^ “African Union demands end to military strikes on Libya, skips Paris meeting”. Sudan Tribune. 19 March 2011. Archived from the original on 21 March 2011. Retrieved 21 March 2011. ^ Kayawe, Baboki (23 March 2011). “Khama supports no-fly zone on Libya”. Mmegi. Retrieved 5 April 2011. ^ “UN authorises no-fly zone over Libya”. Al Jazeera. 18 March 2011. Archived from the original on 18 March 2011. Retrieved 18 March 2011. ^ “Rupiah backs action against Libya”. The Post. 27 March 2011. Archived from the original on 11 September 2012. Retrieved 5 April 2011. ^ “Arab League Recognizes Libyan Rebel Council”. RTTNews. 25 August 2011. Archived from the original on 8 December 2011. Retrieved 25 August 2011. ^ “Tunis recognizes Libyan rebels as country’s rep”. Seattle Post-Intelligencer. 20 August 2011. Archived from the original on 8 December 2011. Retrieved 20 August 2011. ^ “Egypt recognises Libya rebel government”. The New Age. South Africa. 22 August 2011. Archived from the original on 8 March 2012. Retrieved 22 August 2011. ^ Malone, Barry (26 August 2011). “AU won’t recognise Libyan rebel council: diplomats”. The Daily Star. Retrieved 26 August 2011. ^ “Ethiopia recognizes Libyan rebels”. NOW Lebanon. 24 August 2011. Retrieved 24 August 2011. ^ “Libya-NTC: National Transitional Council in Libya”. Afrique en ligne. 27 August 2011. Archived from the original on 17 January 2012. Retrieved 27 August 2011. ^ “Chad recognises rebel council as only legitimate authority in neighbouring Libya”. Al Jazeera. 24 August 2011. Retrieved 24 August 2011. ^ “Benin recognize Libyan rebels”. Reuters. 27 August 2011. Retrieved 27 August 2011. ^ “Algeria declines to recognize Libyan rebels”. NOW Lebanon. 26 August 2011. Retrieved 26 August 2011. ^ “Libyan envoy to Zimbabwe expelled for burning flag”. The Zimbabwean. 26 August 2011. Archived from the original on 26 August 2011. Retrieved 26 August 2011. ^ “Libya: How SA stood firm on money for rebels”. Mail & Globe Online. 26 August 2011. Retrieved 27 August 2011. ^ “African Union officially recognises Libya’s new leadership”. Archived from the original on 20 November 2011. ^ “AU denounces Togo ‘military coup‘“. BBC News. 6 February 2005. Retrieved 10 July 2006. ^ “All is rather easily forgiven”. The Economist. 23 July 2009. Retrieved 15 July 2011. ^ “African Union lifts sanctions on Mauritania”. Reuters. 1 July 2009. Retrieved 3 December 2017. ^ Dixon, Robyn; Labous, Jane. “Gains of Mali’s Tuareg rebels appear permanent, analysts say”. Los Angeles Times. Retrieved 4 September 2018. ^ a b Bernadette Schulz, Ruth Langer, “Peace missions – The long haul”, D+C, 27 August 2013. ^ Besancon, Marie; Dalzell, Stephen (June 2014). “The Soldier and the Street: East African CIMIC in Somalia and Beyond”. PRISM Security Studies Journal. 5: 117–135. ^ “AU Darfur mission ‘to end soon‘“. BBC News. 28 June 2006. Retrieved 23 April 2010. ^ “Security Council Authorises Deployment of United Nations-African Union ‘Hybrid’ Peace Operation in Bid To Resolve Darfur Conflict”. United Nations. Archived from the original on 15 August 2007. Retrieved 26 November 2012. ^ “African move on Bashir dismissed”. BBC News. 5 July 2009. Retrieved 23 April 2010. ^ Sulaiman, Abubkar o.; Agoha, Ifeanyi Chuckwu (1 October 2013). “South Sudan Negotiated Independence: A Critique of African Union’s Role”. European Journal of Sustainable Development. 2 (3): 145–154. doi:10.14207/ejsd.2013.v2n3p145. ^ a b Anderson, Noel (2014). “Peacekeepers Fighting a Counterinsurgency Campaign: A Net Assessment of the African Union Mission in Somalia”. Studies in Conflict and Terrorism. 37: 936–954. ^ Reynolds, Paul (8 July 2002). “African Union replaces dictators’ club”. BBC News. Archived from the original on 1 June 2010. Retrieved 23 April 2010. ^ “Eritrea: Nation Appoints AU Envoy in Ethiopia”. 20 January 2011. Retrieved 9 May 2011. ^ a b “African Union forces seek rebel leader”. France 24. Archived from the original on 15 April 2008. Retrieved 4 September 2018. ^ “Comoros anger over chopper crash”. BBC News. Retrieved 4 September 2018. ^ “Battles on Comoros rebel island”. BBC News. Retrieved 4 September 2018. ^ “Comoran rebel seeks French asylum”. BBC News. Retrieved 4 September 2018. ^ “Comoran rebel asylum plea refused”. BBC News. Retrieved 4 September 2018. ^ “Toybou confirmed Anjouan president”. Afrol News. Retrieved 4 September 2018. “The African Union, NEPAD and Human Rights: The Missing Agenda” Human Rights Quarterly Vol.26, No.4, November 2004.